Over on smithsonianmag.com, they tell us that a "New Jamestown Discovery Reveals the Identities of Four Prominent Settlers" here. 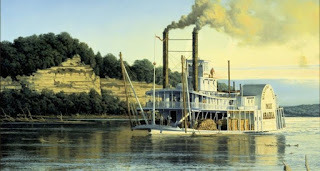 Also, on messynessychic.com, check out "What was Found (and still edible) inside a 150 year-old Sunken Steamboat" here. Finally, on the CBS Sunday Morning YouTube channel, they tell us of the musical "'Hamilton': A founding father takes to the stage." Enjoy!